Sorry for the long silence. Excuses, NYC burnout, confusion, purpose-turning and scrivening, as ever. At first I thought I'd blog about the Chris Hedges controversy, my recreational reading on the plane back to Madrid last month. The war correspondent and OWS symp Hedges attacked the Occupy movement's “diversity of tactics” as an excuse for “violence” by anarchist elements, which he called the “cancer in the Occupy movement.” Of course I think Hedges is packing baloney – people have to assert their rights or they won't have them, including their right to the city. Still, I decided not to blog on this. The text provoked a lot of responses, though, so my comment became superfluous aside from compilation. I refer you to David Graeber's excellent response, the thoughtful rejoinder by Crimethinc and the new Fifth Estate. For the rest, Google will do it. Oh no, I can't help it! The controversy points to the divide between reformists and anti-systemists within the Occupy movement. I don't want to say “revolutionaries,” although it's crystal clear that we cannot go on like this. (Anti-establishmentarians?) And it would be just as foolish to call the reformists the “rot within the Occupy movement.” Everyone needs to be in on this. Tom Hayden stands with the latter camp as he turns 70. (The Port Huron-era SDS just had a reunion convergence at NYU.) He put the current Occupy movement in context with the Civil rights struggle recently, remarking on occupation as a tactic: “The logic of an occupation, I think, is that if you feel voiceless about a burning issue of great great importance, and the institutions have failed you, the only way to get leverage for your voice is to occupy their space in order to get their attention” (Speaking to Amy Goodman on Democracy Now, April 13, 2012). In March at the SQEK/House Magic library show at Interference Archive in Brooklyn, Adrien from Les Cafards in Paris showed films and gave a talk in March. He spoke about “France under global debt threat, seen from a suburb, in between squatted houses, political issues, housing, money and social problems, everyday life, autonomous struggles, and dreams to occupy the entire city.... about sharing some questions and tensions inside social movements outside institutional politics, and inside a small community of activists mostly living in squatted houses in an eastern suburb of Paris. “With some successes and failures, we try to organize to keep away monetary necessities, stupid jobs, part-time contracts, economic pressure. We reach for a bit more freedom, more time, and somehow, by any means we can find, take down the capitalist system. We try to fight against huge urban projects, housing evictions, police practices—in order to build community forces against the crushing metropolis. We try to open and defend spaces for organizations, a social center (for example) in which we can have meetings, meals, shows, and where we can meet, share our situations, our problems, to sort out collectively our pressures and problems.” I see that his bunch is meeting this month at a coffe shop near Metro Robespierre. Great traditions never die! 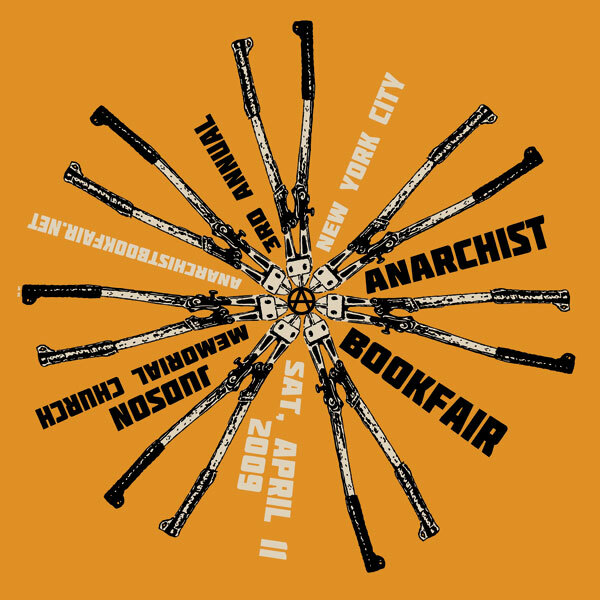 Another SQEK New York participant who is still hanging around the Big Apple is Nathan Eisenstadt, Last weekend he workshopped at the New York Anarchist Book Fair on the story of his group, Bristol Space Invaders. That is a “UK based collective that emerged after an international call-out for days of action in defence of squats and autonomous spaces in 2008. Since its inception the group have been responsible for a range of temporary spectacular event-spaces from large urban convergence centres for particular actions/struggles/gatherings to illicit theatrical speakeasies, high-grade free restaurants, art galleries, squatter-estate agents and finally a more permanent space: the Factory, a huge squatted Social Centre in Bristol, England” (evicted November 2011). Nathan sounds like a swell resource for local creative activists! Wearing his other hat, the Bristol-based geographer who an academic talk tomorrow as a “participant/ethnographer of autonomous spaces” to the Space Time Research Collective, a new student group at the CUNY Graduate Center. MEANwhile, “House Magic” journal #4 is available for PDF download at the website, https://sites.google.com/site/housemagicbfc/. It's really good! And #5 is going to be an assembling – it's an open call. I'm going to try and close it in time for summer. Here's what is in the #4 zine of the “House Magic: Bureau of Foreign Correspondence” project: the bulletin of the information project on squatted spaces and social centers includes many squats launched by the U.S. and European Occupy movements – 44 pages of occupation information and history, in articles and short blurbs. Features: Aja Waalwijk on Ruigoord, an old-time Dutch squatted village, and Rob Robinson of O4O and Picture the Homeless in NYC on international solidarities. Table of Contents – pages of bulletins, including Occupy London's “Bank of Ideas”; the attempt to make a social center in Chapel Hill, North Carolina; and again in Seattle, Washington; a huge collage from the Ungdomshuset cafeteria in Copenhagen; Libertad Guerra's collage celebrating the CHARAS group's work in 1970s Loisaida, NYC; sculptor Ken Hiratsuka's stone commemorating an evicted garden; the program of the Berlin 30 year squat anniversary celebration; a digest of the anti-gentrification work going on in Hamburg; the story of anarchist organizing and the AK57 in Budapest and a travelogue on a “political business trip” to London; an extensive text on the squatted village of Ruigoord, which celebrates its anniversary this year; the story of the legalized Tabacalera in Madrid; and an interview with homeless advocate Rob Robinson on NYC's O4O and its solidarities in Africa and Brazil. My text, “This Show Brought To You By The Squatting Movement” is up at the NY Arts magazine website as part of their spring issue. I also just finished a draft of a talk, “Art + Squat = X” for a talk Universidad Complutense in Madrid, where I am a visiting researcher. When it's decent, I'll upload it to the website, where the predecessor texts are also sitting. Anarchist Book Fair last weekend (although the arts festival continues, April 21-22). House Magic #4, Spring 2012 – download it! print it! sell it! I would agree that there is a divide between revolutionaries and reformists within the Occupy movement. As you might guess, in Occupy Staten Island, the revolutionaries are in rather short supply. But some of the reformists are very nice people, and I don't mind working with them where and when we can find points of agreement. That having been said, I can't help feeling that the Occupy movement will have to split completely at some point. Let's hope that both parts can remain fairly well populated and active (or will become more active, since activity is still pretty limited compared to what was happening last fall). I have also been attending interesting meetings labeled "OWS and Anti-Capitalism," which have been occurring every few weeks at a space in Downtown Brooklyn called The Commons (not to be confused with the OWS-connected think tank events, labeled The Commons (I think), that occurred a couple of months ago). The organizers and most of the people attending, from what I can tell, seem to be of the left communist/council communist persuasion (which I guess is pretty much what I have been during the past decade, though I don't want to say I am that exclusively). I heard about these meetings from "Sander" at Internationalist Perspective, and they have been attended by some well known folks in this area, such as Loren Goldner and Paul Mattick, Jr. (and also some good regular people like me - though, OK, I admit, I am highly irregular, and not in a famous way, and who knows if I am "good" - but you know what I mean). These meetings might soon turn into a series of organized talks about influencing the Occupy movement from an anti-capitalist perspective, and they should be interesting.